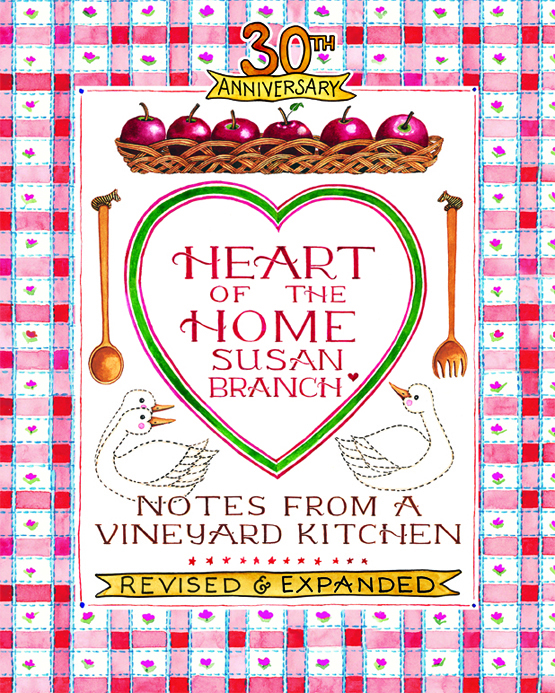 Heart of the Home, Notes from a Vineyard Kitchen was my first book. I wrote it while sitting at the dining room table in my first house on Martha's Vineyard. And 2016 marks the 30th year since it was first published. I'm celebrating this Anniversary with a brand new edition of my first baby, revised and expanded, with new and updated recipes, new art, a new cover, new pages, and new quotes. Plus a lovely ribbon bookmark. I left the book as she was meant to be, a country cookbook full of homey, classic, easy-to-make recipes, family favorites good enough for dinner parties, very much tried and always true. Recipes include: Heavenly Banana Cream Pie, Linguini in Clam Sauce, My Dad's Garlic Bread, Ginger Coconut Lime Soup, Quinoa Salad, Lemon Chicken, Cranberry Cake, and Basil Ice Cream. Fresh ingredients, simple preparations, clean flavors. Heart of the Home, printed in the USA, is a 176-page, full-color, hand-written, hard cover book with a dust jacket and the most important, afore-mentioned, very festive, red-ribbon bookmark. Available NOW from Susan's web store, signed copies, for our customers only.